Joe Finding (red) will be a kay man for Peterborough Town against Wapping. Photo: David Lowndes. It’s do-or-die for City of Peterborough tomorrow (March 12, 1pm) as they host Wapping at Bretton Gate in a game that could decide the destination of the East Premier A Division title. City have to win tomorrow’s match and then hope that Wapping also fail to beat fourth-placed Old Loughtonians in their final fixture the following week (March 19). If that all happens City will win the title and promotion back into the National League as long as they win their final game at Bedford. City manager Graham Finding remains a believer. He said: “The nature of our recent form suggests we are back to our best, so if Wapping are able to contain us they will pick up the title as worthy winners. “Away at Wapping before Christmas we ran out 4-2 winners in a game which we dominated for long periods. “However, that was also a game, in which despite being under extended pressure, Wapping showed their quality . City’s 6-1 win at relegated Bluharts last weekend ensured they are now the only team able to stop Wapping. 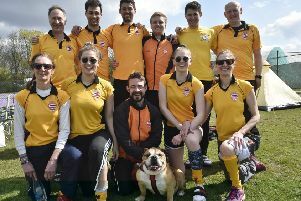 City’s eighth team did clinch a title and promotion last weekend as a 6-0 thrashing of Cambs Nomads ensured they will top Division Six North West North. Dan Barkworth cracked a hat-trick with Stuart Bass (2) and Ian Green also on target. Spalding seconds beat their own third team 3-2 to seal promotion from Division Four. Top scorer Glenn Perkins netted twice, but the thirds remain second and on course for a promotion of their own. City of Peterborough Ladies are now second in East Division One North, but will do well to wrest the title from leaders Wisbech. Wisbech are two points clear with two games to go and they host winless bottom club Letchworth this Saturday, when City have a tough trip to third-placed Norwich City. Bourne Deeping Ladies won 15-0 in Division Three at Newmarket last weekend. Carol Murray grabbed a double hat-trick with Izzy Oakley scoring five times. Becky Allam claimed a hat-trick and Laura Thompson completed the scoring.